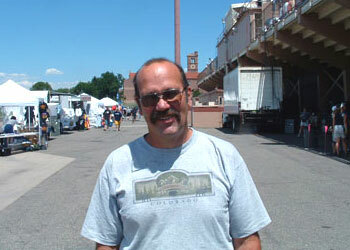 Doug Dyer is a corps fan from Golden, CO. He's a snowplow driver for the Colorado Dept. of Transportation. "In high school, I played tuba in the high school marching band. Of the five kids in my family, four played tuba. I went to the Drum Corps International World Championships finals at Mile High Stadium in 1977. This was my first drum corps show. It was very dynamic for this brass fan. Having been in marching band, I related to how much practice it takes to make the straight lines. "I wasn't able to go to any other shows until now, 27 years later. My wife's niece, Laura, plays in Bandettes and we came out here to cheer them and everyone else. I met her for the first time after their prelims performance. "I like the camaraderie and the whole air of nice young kids. They put in a lot of work and sacrifice and the result is fun. I'm a parent of a 12-year-old boy and I know some of the challenges it takes to raise a good kid. The kids in drum corps are wholesome. "This is a fun way to spend a day."